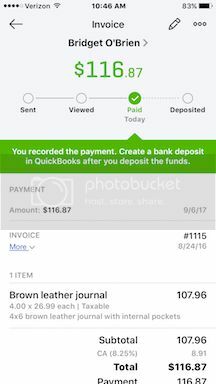 Using QuickBooks Online's Mobile App? - FredCo Accounting Services, Inc. 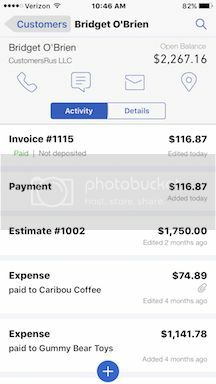 Even if you don’t travel for work (but especially if you do), you should explore what QuickBooks Online’s mobile app has to offer. You already know how convenient it is to be able to access your company’s financial data from any desktop or laptop computer that has an internet connection. Still, there are times when you’d like to be able to complete some of your accounting tasks without firing up a full-blown browser and logging on to QuickBooks Online. 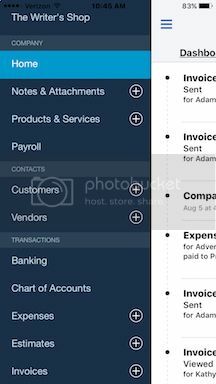 You can’t do everything on QuickBooks Online’s smartphone app that you can do in the browser-based version, but there’s a surprising amount of functionality here. Once you’ve downloaded the app and signed in with your QuickBooks Online user name and password, you’ll see a home page divided into two vertical sections; you can toggle back and forth between them. One is your Dashboard, which displays current account balances and a graph showing an abbreviated version of your Profit and Loss report, as well as a graphical summary of paid and unpaid invoices. Click on Activity to see a list of your most recent actions and transactions. Click on the three horizontal lines in the upper left of the screen, and the app’s main menu slides out. As pictured in the image above, this interactive list also serves as the app’s primary navigation tool. Any data that you’ve entered in the browser-based version (as well as anything you add here) will appear in list form when you click on an entry here. To add customers, invoices, sales receipts, etc., click on the + (plus) sign. You can also enter new transactions from each individual list screen. If you’ve worked with mobile apps at all, you know that the user interface is different from what you see in full versions of applications accessed through a browser. QuickBooks Online’s app, though, is exceptionally easy to understand and use – perhaps even easier than the browser-based QBO. Take the app’s New Expense screen, for example. At the top of the page is a camera icon. Click it to take a picture of a receipt. You can also enter the total manually in a field to the right. Below that are three buttons representing Credit, Check, and Other, so you can indicate how you paid for the purchase. What kind of expense is this? When you click on one, the app opens your list of related data. So, Who did you pay? opens your list of Payees. You can select one or add a new one. Click on the Billable button if the expense can be charged to a customer, and click Add a Split if you need to separate some of the items. There’s also room to add a Ref # and Memo. When you’re done, click Save to add it to your main QuickBooks Online file. You can just as easily find records and transactions you’ve entered either in the browser-based version of QuickBooks Online or on the app. You can follow the journey of an invoice as pictured in the screen shot above. QBO even prompts you to complete steps you haven’t taken. Click on the pencil icon in the upper right, and you can edit the data that appears on that screen. Warning! Editing transactions that have been processed is risky. If you’re making errors that need correcting, we can help you determine when this is safe. The QuickBooks Online app can also provide quick overviews of customer activity, with links to actions. 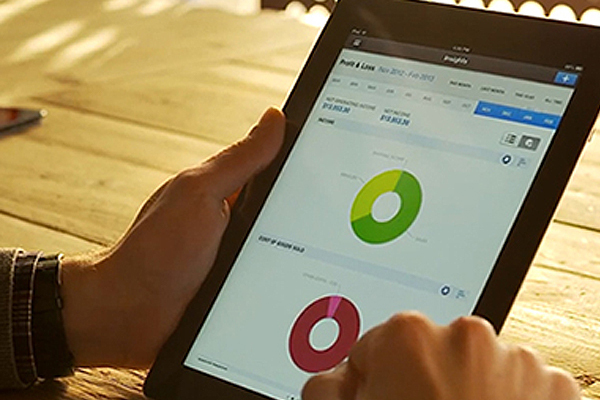 You may never need to access your QuickBooks Online data remotely on your smartphone. If you do, though, we can help you get set up with the site’s companion app so you’ll learn how they work together.